TheDomain Hotel and Spa stands tall in the heart of Manama, Bahrain, with its 36-storey tower visible from every corner of the city. 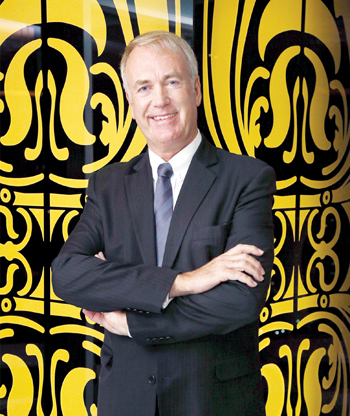 'Visually we stand out and we are certainly outstanding as a concept too,' says the property’s new general manager Frank Normann Eikeland. The upscale five-star lifestyle hotel, located in the Diplomatic Area, completed two years of operation recently and is looking to the future with confidence. Eikeland, an industry veteran, admits that it has been a challenge to place the right product in the market. 'Whether you are an independent hotel or you belong to a brand, you face the same issues. You need to get the message out and you have to have a strong sales organisation to penetrate the market,' he says. During the two years, the hotel’s financial performance has improved steadily and 2015 was with a decent year, he says. The hotel’s management team has been strengthened recently with the aim of achieving higher goals. 'We have been able to take a fair share of the market and have set ourselves a good target for this year. Our strategy for 2016 is to go from good to great,' he says. The independent hotel, which prides in its slogan 'stay, work and play', boasts one of the best content in the market and is targeted at adults. The Domain Hotel and Spa offers 34 elegantly decorated executive guestrooms and 97 spacious luxury suites, featuring state-of-the-art facilities, floor-to-ceiling windows and panoramic views from every room. Guests are offered a personalised service by a butler. The main selling point of the hotel is its content and the concept, which are diversified and unique, continues Eikeland. 'We are not here to blend in, we are definitely here to stand out,' he says. The rooms and suites are all located from the 17th floor upwards. 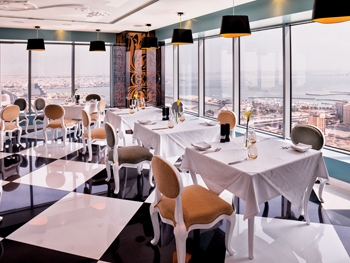 All the restaurants and public places are also on the top levels, providing spectacular views of Bahrain Bay and the city. The hotel has a total of eight restaurants and lounges, making it a great dining destination. Each of the restaurants offers a different feel. The two-floor Vie Lifestyle Lab is an urban wellness spa which focuses not only on relaxation and rejuvenation, but also has a revitalisation programme. A highlight of the spa is the Iyashi Dome which helps lose calories quickly. The hotels plans to introduce a private styling service soon. Eikeland hopes to increase the corporate part of the business this year. 'We have succeeded in the leisure segment and our focus will be on corporate and meetings,' he says. 'We are perceived as Bahrain’s best kept secret. But it’s time to be discovered!' he says. Bahrain’s market is highly competitive and demand doesn’t match the supply as of now, according to Eikeland. 'There is no one in Bahrain that has 80 or 90 per cent occupancy on a continuous basis. And there is more supply coming in. So you have to find your uniqueness, you have to sharpen your skills. It’s going to be a bumpy road ahead,' he says. BAHRAIN urgently needs more public beaches and more outdoor activities to attract Western tourists who seek the sun and the sea, says Eikeland. “Bahrain is a beautiful island with abundant sunshine and still we don’t have many beaches. It’s a huge contradiction. When you know that the whole Western world is dreaming of coming to a place like this, how come there are no beaches accessible to the tourist,” he wonders. Bahrain can be a major Mice destination and all hospitality players must work towards bringing more events to the kingdom, he says.